Although the restaurant was not far from our flats, we nearly got lost on the city’s seemingly arbitrarily signed streets, saved only by the GPS on her ever-useful Blackberry. 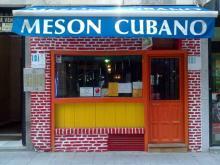 Even so, we were just about to give up at one point–when from the monotonous drab stone buildings of central Madrid, suddenly sparkled the colorfully painted exterior of Meson Cubano. You could almost hear the choir in the background. Just a little bit of heaven, in the heart of Madrid! Walking through the bright orange door was like transporting from Europe directly to the Caribbean. The atmosphere was warm and inviting. About 3 people seemed to be running the place: a husband, wife, and daughter, with a few friends coming in for a few drinks and to chat with them throughout the evening. They only had a few things on the menu. Humble though the selection was, each item was absolutely sublime! So one of the heavenly side dishes was “yuca con mojo.” I absolutely adore yuca, whether fried up with salt (as my favorite Peruvian restaurant near DC makes) or boiled up with veggies and stewed meat (like I had in Nicaragua). But this particular way of preparing yuca took the proverbial cake. And so I share it with you here. We always ate this with other top recommendations from the owners, who were super friendly and all too willing to sit down with us, pour us some complimentary rum and hang out with us for a while for some relaxed chit chat. They told us yuca con mojo would go good with ropa viejo, arroz congris, and an ice cold mojito made with lots of fresh mint. And boy, were they right!!! (Yes, more of these recipes are to come!) But, if you don’t cook Cuban yet, just feel free to throw this together with any meal where you need a tangy, starchy side dish. I actually made it to accompany my Baja-style fish tacos the other night. 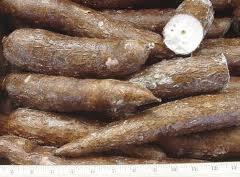 Yuca is a tuber that is used in cooking throughout Central and South America, much like taro in Polynesia. This is not to be confused with the yucca plant, a hardy plant with spiky leaves which those of us from Las Vegas are used to seeing when driving out of town. Yuca is a starchy addition to any meal and can easily replace potatoes, which explains why many Latino restaurants will offer yuca fries alongside potato fries. If you haven’t at least tried them, what are you waiting for? It’s fabulous! The humble yuca. Photo from agroexportpococi.com. I wanted to find a recipe that mirrored exactly what I had at the restaurant. I had asked the owners and they mentioned that it was a very simple recipe with lime and onion, so I kept to that. I did manage to find this recipe, which looks amazing! As it was, I didn’t have lemons and I didn’t have quite as much yuca on me as the recipe called for, so I improvised. The quantities used were more or less eyeballed, so go ahead and just play with the proportions to your own taste! Preparation time: About 15-20 minutes, including peeling and cutting the yuca, onion, and garlic. Set some water to boil in a pot. While you’re waiting for the water to come to a boil, you can prepare the yuca. First, rinse off the yuca and use a sharp vegetable knife if you have one. The yuca actually isn’t that hard to peel if you have a sharp knife. And once you get past the tough skin, it’s actually quite soft on the inside. To get an idea of how to peel the yuca, you can watch this video. Once you have peeled the yuca, remove any tough parts and cut up into pieces about 2-3 inches in length and 1/2 inch wide. Place the pieces into the water once it reaches a boil. Add the salt and a few squeezes of lime juice if you have some to spare. 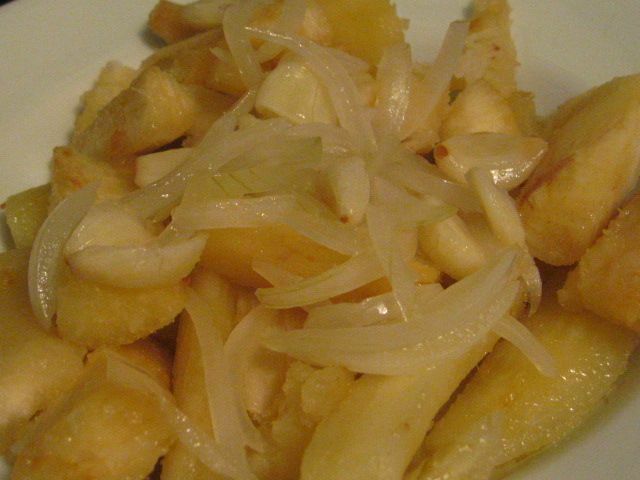 Cook for 45-50 minutes or until the yuca is soft. Drain and set aside. Frying up the onions and garlic with the yuca waiting in the background. Trust me, this smells SO good in your kitchen!!! While that is boiling, heat up the oil in a small saucepan and fry up the garlic, onions, olive oil and reserved lime juice, stirring occasionally to avoid burning. 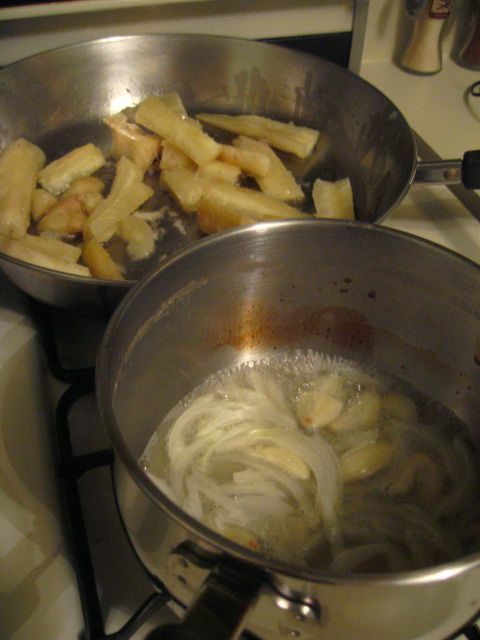 When the onions and garlic have softened, remove and pour over yuca in a bigger saucepan, stirring until just slightly browned around the edges. Remove from heat and serve! One of the all-time best side dishes... EVER!!! Thanks lulu, I’d love to hear how it goes!